On Wednesday, January 25th I will be doing a session on Performance Testing SharePoint 2010. This free session is online with a 20 minute presentation and demo and then Q & A starting at 12:25pm. Join us if you are available and can attend. Contact Denise Faustino for information on how to log into the session. Shai Raiten has posted a blog on how to change the Test Scribe template. Test Scribe is a tool for turning your Test Plan in to a document. The default template can be changed to include or exclude information that meets your needs. Check out Shai’s blog for instructions – How to change the Test Scribe template. Partner of the Year award for Application Lifecycle Management. Congratulations to Objectsharp and the Sharpe's. Anutthara is the Program Manager in the Visual Studio ALM Test Tools group at Microsoft. She is doing a series blog on Exploratory Testing. Anu's team does exploratory testing on all their projects and is well versed on the topic. Follow Anu's Exploratory Testing series by clicking here. 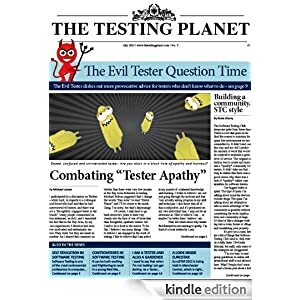 Just released the July edition of The Testing Planet. Testa … enjoy reading about testing by testers. Sign up for an Object Sharp workshop on Exploratory Testing at TesTrek 2011 in Toronto, Ontario on November 11th at 1:30pm. Myself and Dave Lloyd will be presenting plus giving you hands on experience doing exploratory testing. See how to overcome the challenges of tracking the steps you took, reporting bugs and retesting exploratory bugs. In 1983, the term Exploratory Testing was introduced. Prior to that, we called it ad-hoc testing. Exploratory testing is said to be a mindset, a way of thinking, freestyle testing that liberates the tester to explore. Testers, through experience, know their applications inside out; they are the users in reality. Freeing testers to explore and use the application has been proven to identify more bugs then traditional scripted testing. However, there are obstacles and challenges related to this freestyle testing. Join this workshop to explore those obstacles hands on and learn how we can overcome them. Explore an application with known bugs and see if you can find them. Experience exploratory testing using the Microsoft Test Manager Tool. Do your own exploratory testing on a Virtual Machine in the cloud. Discover the difficulties of exploratory testing, how to track the steps, report the bug, and perform retesting. Participate in idea generation for overcoming the issues of exploratory testing. Sign up for the first TesTrek hands-on workshop.